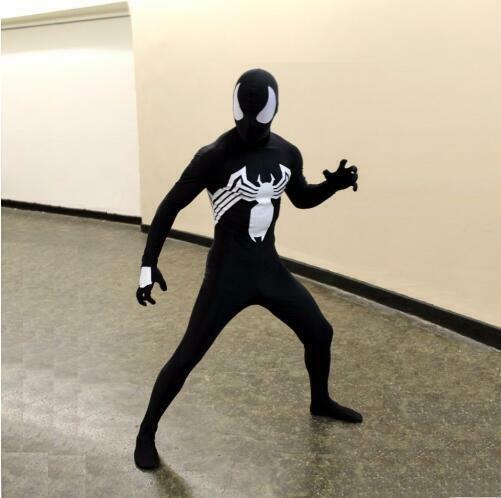 eBay FeaturesColor: White & BlackTheme: SpidermanDesign: Full BodyFabric: Spandex Lycra (High elasticity)Type: Zentai suitWeight: About 10.6 oz Package include: 1 x Zentai Suit PaymentWe can only accept PayPal payment .Shipping1. To USA, please check the delivery estimate of every listing page.2. International Buyers, please note: a. Import duties, taxes and charges are not included in the item price or shipping charges. These charges are the buyer's responsibility. b. Please check with your country's customs office to determine what these additional costs will be prior to bidding/buying.3. All items will be shipped to buyer's eBay address. Before you pay, please make sure your address in eBay match the address you would like us to ship to.4. We do not ship on weekend or public holidays. Return Policy1. Return shipping fee is the responsibility of buyer unless the return is a result of our mistake.2. If you need return, please contact our customer service representative within 7 days after you received the item, let us know the detailed problem and send us some pictures for confirmation. Note: Used or altered items cannot be returned. FeedbackIf you feel delighted with this transaction, Pls give us all 5-stars . We strive for 5-star service by providing high-quality goods and perfect service.Therefore, pls take the transaction seriously. (Positive)feedback is simply what we seek for. If you have any problems about your purchase, just let us know through "MY MESSAGES".We promise that we will try our best to solve problem for you since our mission as ebay seller is make sure that you are satisfied with your every transaction. So Pls contact us first to get the best solution before leave a (Negative) or (Neutral)feedback. ^^Thank you so much!^^Do believe: It needs cooperation and negotiation between buyer and seller to seek a solution for the problem, any bad feedback is little value.